Stop signs are so ubiquitous to our fast-paced, modern way of life that most of us rarely sit down and think about what goes into making such a universally recognized sign. For instance, did you know that using the color “red” for stop signs extended from the railroads, which signaled “red” to stop trains? In historical mythologies, “red” was frequently used as a color to signal eminent danger. 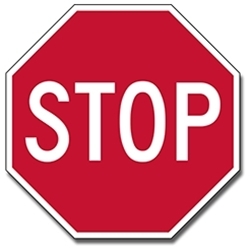 The stop sign got its eight-sided shape from the newly formed Manual on Uniform Traffic Control Devices (MUTCD) that sought to standardize stop sign construction from coast to coast. Prior to 1954, a stop sign in one state might look very different than a stop sign in another. Though today there is almost worldwide uniformity in roadway stop signs, there are variations in their reflective quality. MUTCD currently accepts three main reflective grade signs: Engineer Reflective Grade, High Intensity Reflective Grade, and Diamond Reflective Grade. All three signs have high levels of visibility and are comprised of heavy-gauge, (.080) aluminum that is lightweight and won’t rust. The Engineer Reflective Grade, the standard model, is ideal for business and non-critical traffic sign usage. Its reflective sheeting or topcoat layer provides sufficient luminosity for use in low traffic areas. The Engineer Reflective Grade can be used for stop signs, parking signs and no trespassing signs. The High Intensity Reflective Grade, or middle-level model, is better suited for high-volume traffic usage. It provides greater reflective qualities for superior nighttime visibility even in heavy snow or rains. This reflective quality is due to encapsulated glass beads or High Intensity Prismatic (HIP) technology that is part of the advanced sheeting process. Such lighting capacity improves the reflective quality of the signs four times over the standard ones. Diamond Reflective Grade, or top-grade model, provides the greatest luminosity available today. Used for traffic control and guidance signs, this diamond reflective grade is sure to get the attention of road-weary drivers when it is most important – within 500 feet. Such reflective grade signage is ideal for nighttime usage and areas prone to tough weather conditions of rain, sleet and snow.